Ryan Juneau serves as Asset Manager where he is responsible for ancillary development and construction, property operations, leasing, financing, financial reporting, and investor relations for internally owned, joint venture, and third-party managed assets. His portfolio includes both newly opened and mature shopping centers and office buildings in Lafayette, Baton Rouge, and Slidell, Louisiana, as well as overseeing management of the PMAT Companies’ portfolio of shopping centers across the southeast and mid-west. After joining Stirling Properties in 2013, Mr. Juneau worked for three years in the Development Division as a Project Manager where he oversaw several new development and renovations of retail, office, multifamily, and infrastructure projects. In that role, he was responsible for due diligence, entitlements, construction management, and tenant coordination. 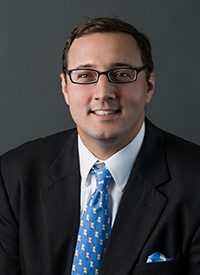 Mr. Juneau started his career as a consulting associate for the large accounting firm, CohnReznick, in Atlanta, GA, where he worked in investor due diligence, financial modeling, and capital structuring of tax credit real estate deals. He later moved home to Baton Rouge to handle development and acquisitions for le Triomphe Property Group. An alumnus of Louisiana State University, Mr. Juneau holds a degree in Finance/Real Estate and later graduated from the Executive MBA Program. He also completed the Certified Development, Design, and Construction Professional (CDP) certification from ICSC and is currently pursuing a Certified Retail Property Executive designation. He is active in the Baton Rouge Area Chamber of Commerce and serves on the Board of Directors for GaitWay Therapeutic Horsemanship, a nonprofit in the Baton Rouge area providing Equine Assisted Activities and Therapies to individuals with special needs.